Sara Dudzinsky is the nicest! We got to have a cookie and coffee picnic on her studio floor, talking about jewelry and inspiring projects. 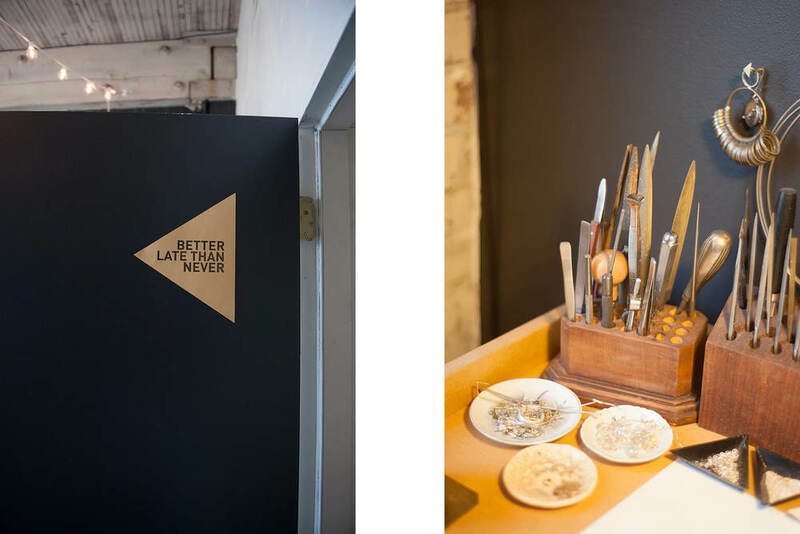 Her studio has been beautifully claimed as part studio and part showroom for her jewelry line Better Late Than Never (BTLN). We were in awe of her prolific creativity from her jewelry line to the plant hangers she had made that we couldn’t stop admiring. The space is tricked out, with every last detail thought of. She even made her own geometric tacks out of scrap metal. There is something so special and real about her that transcends through her jewelry. From her popular stone stud earrings to her amazing brass cut out necklaces, we need one of each! Enjoy our studio visit with Sara! 1. Why Portland? What was it that drew you to Portland or has kept you here? It was the quality of life and, oddly enough, the climate that drew me to Portland. I like the rainy winter much more than the snowing winter I grew up with in Cleveland OH. I moved here about 8 years ago with my man, Will Preisch, the chef of Holdfast Dining. It's seemed a great city for a newly self employed designer and young cook. 2. What are your favorite things happening in Portland (design or otherwise)? True to form my favorite design things happening in Portland right now are all the amazing jewelry the other local designer are making right now. We have a large amount of amazing designers for a town this size. Some of my absolute favorites that I just cant get enough of are Hazel Cox, Tiro Tiro, AK Vintage and Takara. 3. How did your brand start? I have had a love affair with jewelry pretty much for ever. I went to college for metals in jewelry at the Cleveland institute of art. It was during college that I decided I wanted to start my own jewelry line. I started BLTN about after I graduating and moving to Portland. Taking my art jewelry back ground and adapting it for a fresh take on small scale production jewelry. 4. What has been your biggest obstacle? Being self employed can always be a challenge. However, I love, love, love my job and have some amazing self employed friends which definitely helps me stay motivated. 5. Who are your design icon(s)? I'm currently a little obsessed with antique cultural jewelry. Dear Indonesian jewelry designers/makers of the late 18th century... I think i love love! 6. What are your favorite things about Portland? I love the large community of makers there are in town. I feel that everyone really supports each each other. Plus the people of Portland really love to support everything local which is awesome. 7. Your favorite thing about your workspace? 8. Tell us two truths and a lie! I've been to Denmark twice, I have a great singing voice, I was a synchronized swimmer for 10 years. 9. 5 things you can’t live without.